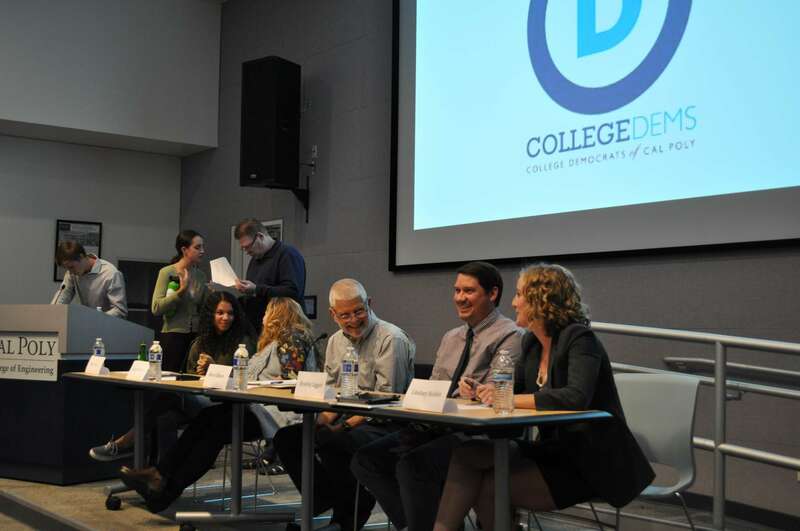 The Cal Poly Democrats club hosted an on-campus panel discussion called “It’s Complicated: Balancing Free Speech and Inclusivity on a Public Campus” Nov. 13. The panel was intended to be a counter-event to Cal Poly College Republicans’ controversial Free Speech Wall, which often is marked with racist and homophobic slurs. The wall is usually put up in early November, but has yet to return to Centennial Lawn this year. Political science sophomore and Cal Poly Democrats Co-President Eireann O’Grady said club members decided the event was still beneficial enough to put on, even without the Free Speech Wall up. Five panelists at the event debated the balance between free speech and inclusivity in front of a more than 60 person crowd. 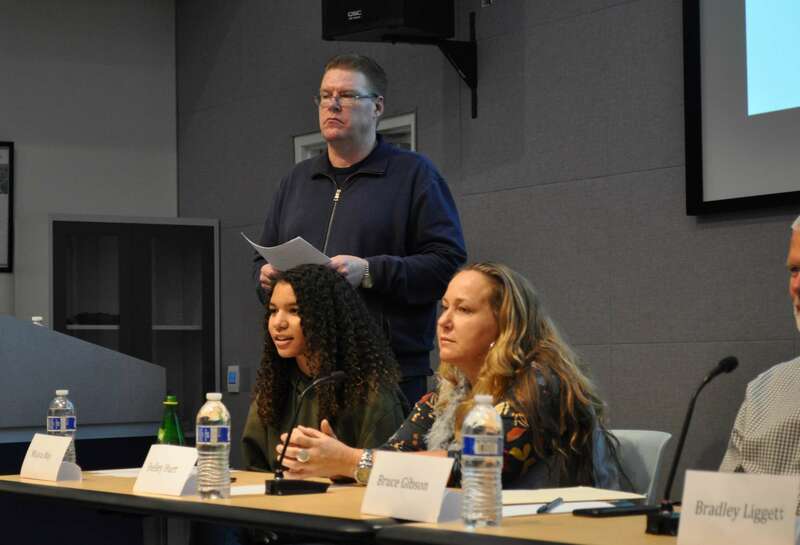 The panelists included Cal Poly animal science sophomore and Black Student Union member Miaya May, Cal Poly political science professor Shelley Hurt, second district county supervisor Bruce Gibson, local attorney Bradley Liggett and San Luis Obispo Tribune reporter Lindsey Holden. Should free speech on a public campus be more limited than in a public square? Professor Hurt argued that an absolutist approach to free speech on a public campus can harm students’ academic freedom. While she said she values absolute free speech in public, she believes a university has a responsibility to put students’ academic freedom and success first, which can be negatively affected by hateful free speech. Gibson, however, said he believes there should not be a difference between free speech on campuses or in public, and that the main issue is not absolute free speech itself, but the abhorrent thoughts and beliefs behind hateful speech. He said he believes it is especially important for college students to be exposed to the full spectrum of free speech on campus so they can properly learn how to respond and support the speech they agree with. How should accountability tie into free speech? May stated she believes hateful speech and acts keep occurring at Cal Poly because the university does not have appropriate consequences for students involved. Gibson said there needs to be more accountability with hateful free speech. He questioned why those who write hateful messages on the Free Speech Wall are not required to stand next to what they wrote and defend their views. Liggett agreed and proposed the club videotape the free speech wall to hold people accountable for their words. Tribune reporter Holden also said she thought anonymity is damaging public discourse. She referenced how the Tribune used to allow anonymous comments on their website, but after many hateful messages, commenters must now be identified through their Facebook account. Who should decide the difference between free speech and hate speech? May said that people who decide what qualifies as hate speech are often in positions of power and may have never been a victim of hate speech. Liggett then asked if the audience would feel comfortable with the government crafting a law to draw a line between hate and free speech. After stating his own uneasiness with that thought, he said it is society’s responsibility to protect free speech and minimize hate speech. Hurt said that faculty members, not the government, should be responsible for defining the difference between hate and free speech on Cal Poly’s campus. She said the faculty has a responsibility to protect students and foster a positive academic environment. Does Cal Poly spend its money effectively? Hurt questioned if there should be a limit to the money Cal Poly spends on security for controversial speakers. Last spring, the university spent more than $86,000 on security for alt-right speaker Milo Yiannopoulos’ on-campus talk. She suggested that clubs who invite controversial speakers should have to pay their own security costs and the money the university saves should go to funding minority staff or student scholarships. May agreed that Cal Poly is not spending its money efficiently. She said that current resources for minority groups on campus are underfunded and that Cal Poly should spend more on programs to help create a more inclusive and welcoming campus. Is it bad to be sensitive? After an audience member asked if the panelists believed people are growing too sensitive toward free speech on campus, May challenged why sensitivity is considered to be bad. The panelists all nodded in agreement. Professor Hurt said she liked the saying and jokingly suggested someone make “It’s okay to be sensitive” bumper stickers. After two hours of panelists answering questions and debating the free speech and inclusivity issues, Cal Poly Democrats club co-presidents closed out the discussion and reiterated why they held the event.